The society always had a vision of either renting or owning a plot of land and building a 'home' on it. 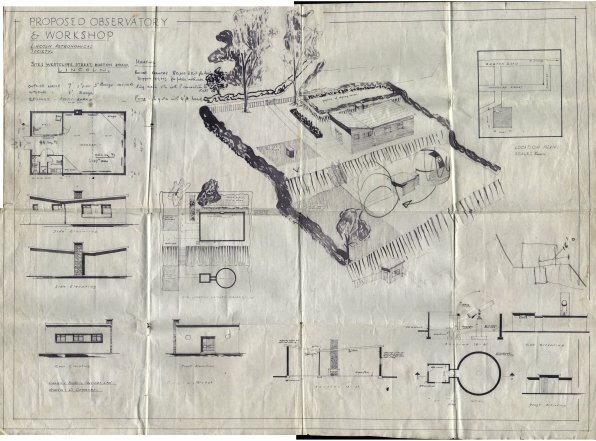 To get an idea of what type of premises would be suitable for an astronomical society, visits were made to several of the local societies including Chesterfield, who already had their own lecture hall. 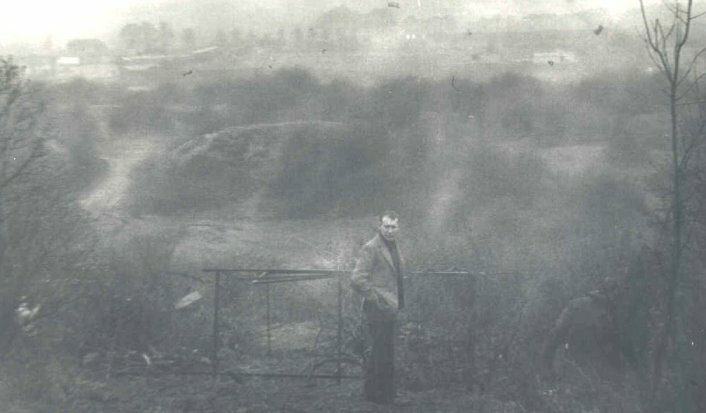 Following an article in the Lincoln evening paper, the society was offered a piece of land on the Burton ridge in Lincoln. It was not ideal being down a hillside and covered in barbed wire, trees and brambles - but it was cheap and did have very good views to the south and west. So it was purchased in January of 1960 for the sum of £20 cheap for a quarter of an acre even then. Our first view of the site showed its potential. Although the view of the sky would be limited to the east, there were no obstructions down to the western horizon and only trees to the south. 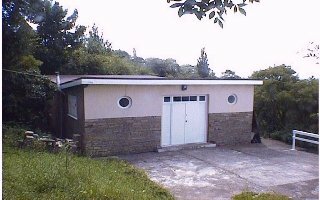 Initially the idea was to purchase an old nissan hut for the general meetings and follow this with an observatory. Plans were changed when it proved impossible to raise the £1000 needed to start the project. The new plan was even more ambitious but could be done over many years. 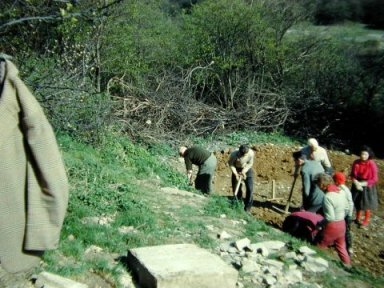 An access to the site had to be cleared and a flat platform constructed for a lecture hall. The site was full of rubbish and this had to be removed. 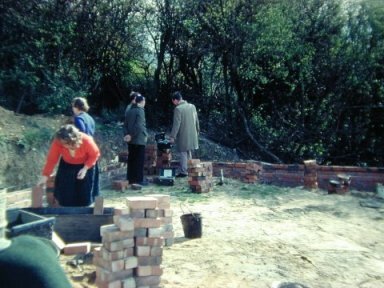 Tools were taken to the site on every visit and as the work level increased, it became apparent that a lockable shed on the site would be a great help. 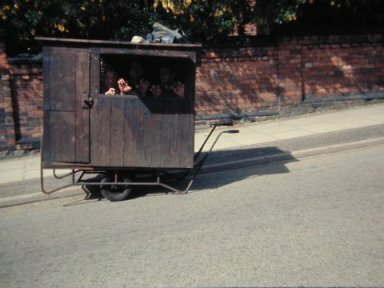 In 1961 Dr Falla ( a society member) had no use for a chicken hut and donated it to the society. 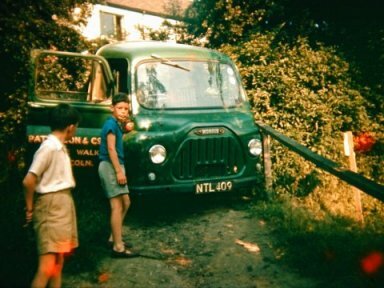 The only problem was moving it from a village called Bracebridge Heath to the society. Lincoln is divided by the river Witham and this hut was on the hill on the other side of the valley to the society. 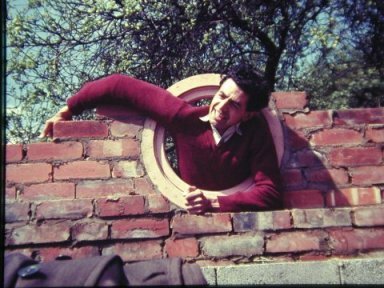 So one weekend, the committee pulled it down Cross O'Cliff Hill, through the streets of Lincoln and up Yarborough Hill to the society's premises. This shows two of the committee inside the hut part way up the hill, just before a passing policeman asked what was going on. This became the tool shed for a time, but one night the hut disappeared from the society's land complete with tools. With the site cleared and leveled, the foundations could be dug. These had to be several feet deep in places as the Lecture Hall is on the side of the hill. On one occasion, a lorry driver decided to deliver sand and gravel directly onto the site. 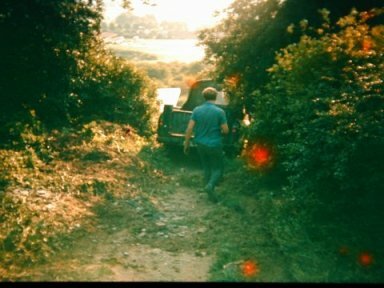 The lorry became stuck and couldn't reverse back up the hillside. Another lorry complete with tow rope arrived and it too got stuck. 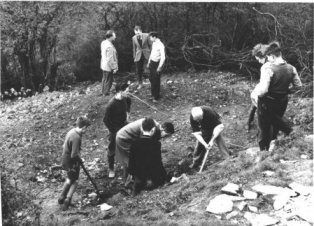 Yet a third was required to pull both up the hillside and back onto the road. 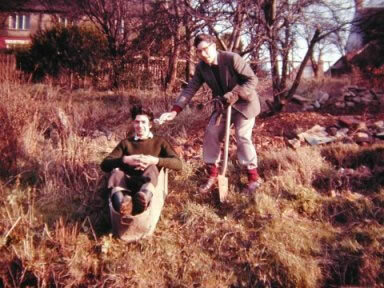 From that day onward, all building materials have been dropped at the roadside and carried down the hill in wheelbarrows. The base of the Lecture Hall was now nearing completion. Stones had been compacted to form a less muddy surface to work on. A shortage of bricks were starting to slow down the building work, then a member heard of a possible source of bricks. They were about 10 miles away, but that didn't matter, they were free. Very little of the Lecture Hall was 'new'. The bricks came from Bardney Airfield when it was being demolished. The stones for the walls are ex British Rail platform slabs 8 feet by 4 feet that were cut to size. The floor is made of concrete. Twelve cubic yards were wheelbarrowed down the hillside one Saturday. 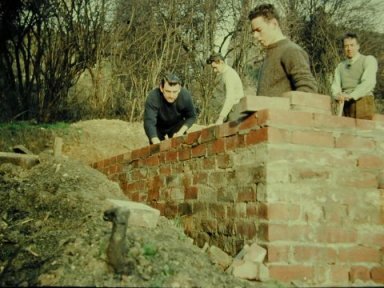 The walls continued to rise weekly now and reached the top of the Lecture Hall by Easter 1962. On the right we see inside the building. Just in view (right) is the french windows which would lead to the observatory (one day?). Building continued evenings and weekends throughout 1962. 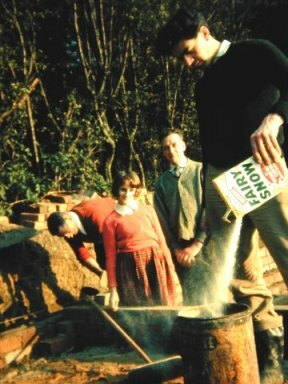 A steel girder was lifted across the width of the hall and a temporary cover made for a firework barbeque in November 1962. The fund raising event was attended by 150 people each paying 6d. 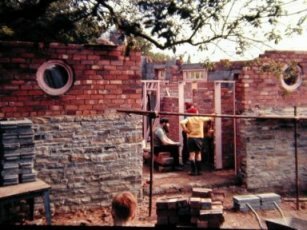 Joists were fitted between the girder and the walls to form a slightly 'V' shaped roof. 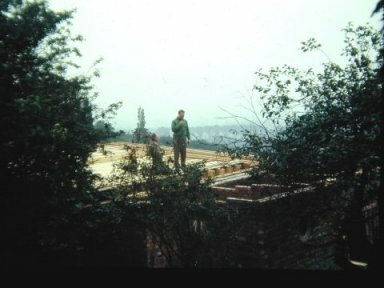 The joists were covered in timber and waterproof felt to form the roof. At last the Lecture Hall was weatherproof. Fund raising continued with Treasure hunts, Social Nights, Bingo Sessions and Jumble sales. 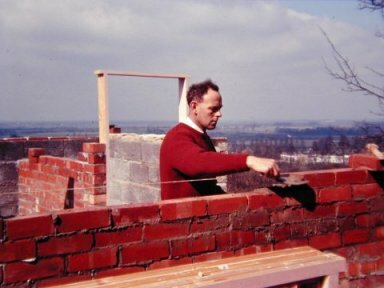 The first lecture in the new building was in July 1963. Membership had increased to 90 and a separate junior section was formed. 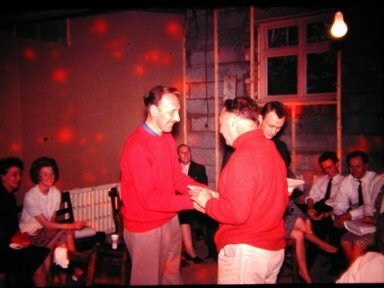 One of the first events in the hall shows Peter Hammerton (left) being presented with the prize for most points in the car treasure hunt, by Chairman Gordon King in the summer of 1963. The society was now running a boiler fund where members committed themselves to donating 2/6d per month to raise money for a heating system. The society now met in the Lecture Hall on the first Tuesday and 3rd Friday each month. Chairs came from St.Georges hospital in July 1963. A trench 7 feet deep had to be dug for the base of a retaining wall. This wall is mainly of concrete, reinforced with steel rods and was back filled with rubble and compacted. 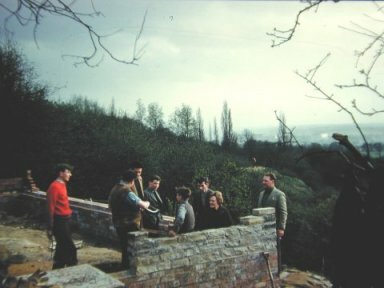 The terrace outside the hall was originally built for telescopes as an observing platform but this activity was held up due to lack of bricks and money. The lecture hall was nearly complete. 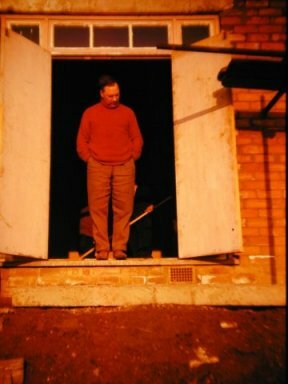 Here the Chairman surveys the area outside the door and wonders about the amount of work still to be done before the official opening. 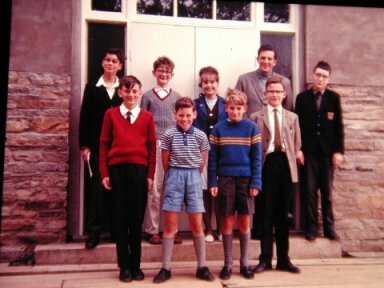 At this time the society had a very active junior section. It was run by John East and had its own separate meetings, talks and viewing sessions on the 2nd Friday each month. 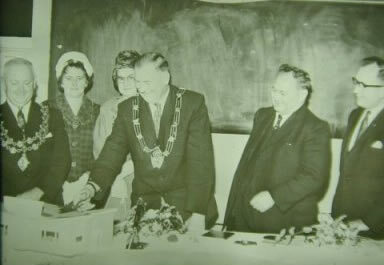 On Tues 24th September 1963 the mayor of Lincoln- Councilor Coles (centre) opened the Lecture Hall- to his left is Frank Eccleshare (society president). Also in attendance was the Sheriff of Lincoln. It was a very wet night. Councilor Eccleshare opened proceedings with a history of the society. All the lights went out but he carried on. The fuse was replaced and the opening ceremony continued. Meetings now became monthly- on the first Tuesday. By 1964 is was apparent that security was likely to be a problem. all windows had to be shuttered as they kept being broken by air gun pellets. Also members were being shot at on occasions. 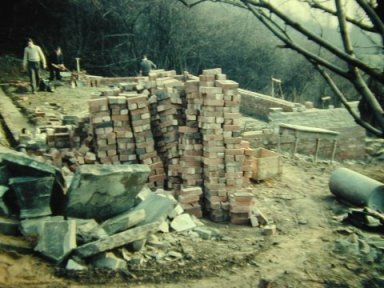 The lecture hall was not finished until the summer of 1967. The entrance hall ceiling is of the Milky Way painted by one of the society's artists- Peter Lightfoot. The picture of the solar eclipse was painted by David Hardy in 1968.